Obviously the Capetians make a difference etc, and gear tier etc but assuming players are all level 85, what makes a good squad? A blend of attacker, tank, healer and support? Do squads need to be different for Squad Arena than they do for raids or dark/light side battles etc and if so, why and how? Typically all same faction with a strong leader ability, some kind of healing / rez capability, crowd control abilities including a taunting tank and of course damage output. Don't get too hung up on the attacker/healer/tank/support tags. They're often misleading. Grand Master Yoda, for example, is a "support," but he hits like a train and is the main damage dealer on a lot of Jedi teams. Likewise, there are "tanks" that can't taunt and deal lots of damage. "Healer" and "Attacker" are mostly accurate I guess, though Visas Marr is tagged as a healer and seems more like a hybrid of both. You're better off looking at each character's individual kit and figuring out how it would fit into a full squad - what does it counter, what will it synergize with, etc. Synergy makes a good team. A good leader ability and characters that specifically benefit from that leader ability. Look at the top of your arena for examples of teams that are doing well for people that started around the same time you did. To add on to this - some characters are outliers and just rule regardless of who they are used under. Enfys Nest, Commander Luke, and Grand Admiral Thrawn are good examples - you'll frequently see them on teams that otherwise consist entirely of another faction. Focus on building a squad that is centered around a faction. First Order, Jedi, Bounty Hunters, etc. I didn't get past the 300 rank in arena till I started focusing on one faction. My favs are First Order with Kylo Ren Unmasked lead, Resistance with Rey Jedi Training lead, Jedi, and Bounty Hunters. The best leaders in the game pretty much give bonuses to their faction, like Emperor Palpatine with Empire and Sith tagged toons, or Jedi Knight Revan with Jedi and Old Republic tagged toons. If you have a swgoh.gg profile you can share we could offer more specific advice. Thanks Rath - how do I do that? Synergy with good lead. Ability to beat multiple teams not just one(takes skill to do even counter teams). Right mod combinations to maximize effectiveness of squad and necessary gear and abilities that put u on equal field as other. If u r able to do all this u will find ur self at top of squad with those that can’t behind u no matter what meta. Go to Swgoh.gg, make a login and profile, post the code here and folks will have lots of suggestions. Posting a link to your profile would be more helpful. I'm sure you would find some help, if you do. Alternatively take a look at the top ranking teams of your arena to get an idea what makes a good team. I'd try focusing on resistance trooper, since zFinn and Poe are some of your best characters. Also I'd focus on Darth Nihilus, because he is also one of those characters that fits into any squad. So choose a good faction, make a team with it with a good leader, and you could plug in CLS, Darth Nihilus or Thrawn if you want to. 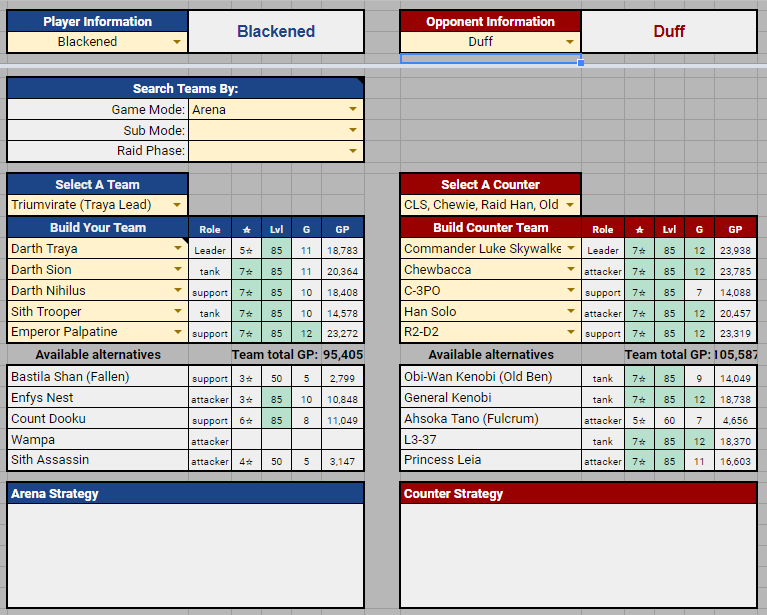 The SWGoH Squad Builder spreadsheet is designed to be a centralized resource for players to find every team combination for all available game modes including: Events, Raids (by phase), Arena Meta (including counter teams), Territory Wars, Grand Arena and Prestigious Quests. What is your arena team, Palpatine, Vader, Tarkin, Stormtrooper, Maul? Why is Vader's lead zeta'd when Palpatine should be leading? The classic starting lineup for Imperial command squad is Palpatine, Vader, Tarkin, Tie Pilot, Thrawn. Overwhelm the enemy with debuffs and AoEs. Sith, notably Sion / Nihilus can be swapped in as desired. Your modding is bad: incomplete sets, lacking potency where appropriate and all the speed of a stunned snail standing in superglue. You need to address that. Finish your Phoenix squad to 7* Thrawn next time and in the meantime see if you can compensate with more gear levels and better modding to make him arena viable. I'd keep farming phoenix to upgrade your Thrawn to 7*. Thrawn is a very strong character, who fits well in most teams. For arena I'd suggest to either switch back to jedi (zBastilla lead, GMY, Ezra, Old Ben and Thrawn fir a start) or develop your empire team. zEP, Vader, Tarkin, Thrawn and TFP can still take you to rank 200. (But your jedi will probably be stronger). Switching to a new team without sorting your mods is a wasted effort. Mods make a huge difference. You should read up and do it properly if you want good results. I’m getting there! I’ve read up on set bonuses, what the A-E ratings etc are so I’ve redistributed what I’ve got. Need to read up on slicing etc now. Trying to focus on speed mods if I can. Should you try to have a mix of mods/set bonuses across your team members? Mod set types and stats should reflect each individual toon's role and abilities and the way you use them. If the character has debuff abilities you rely on, give them a potency set &/or cross.